From our experience working with a wide range of companies, we find that the participants are well equipped and are extremely technically sound. When we look at their behavioral skills and levels of competency in these areas, they seem to be a bit off the mark, in some cases quite off the mark. What we have through that understanding & interactive exposure developed specific models and patterns for CHANGE. This is what we are briefly outlining below. You are welcome to connect with us for a complimentary Curtain Raiser. This Curtail Raiser, is a face to face interaction with us and it will provide specific details of these sessions and how it could be interweaved to suit your organization. 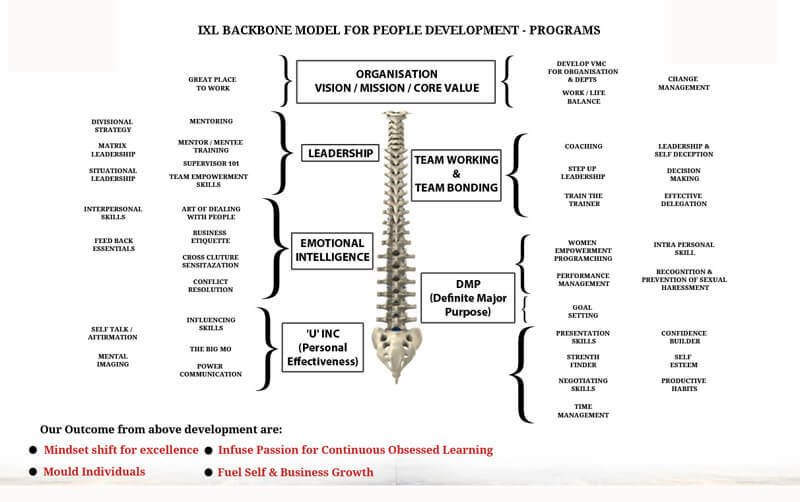 We have developed and use a model which we commonly refer to as The Backbone Model. This model spreads across two phases. The first phase is made up of three separate session;U Inc & The Self, Clarity DMP Definite Major Purpose, Emotional Intelligence. The second phase envelopes two sessions; Team working & Building followed by Leadership. During the Needs definition phase, especially after discussions with management and participant, we will investigate and recommend the approach to take for effective cementing of the training. Our training solution focuses on development of THE SELF, as a person. Here we provide a suite of programs such U Inc, Personal Effectiveness, A Person of Influence, Self-Image Mastery, Art of dealing with people and Who R U. These programs, individually or selectively forms the rudder for the Organization. It does provide the cutting edge that the individual would need, to market himself/herself as a 21st century executive / person. Following our discussion with management and the participants we will recommend the most effective session, or a combination of these session. We build on the above foundation of THE SELF in providing direction and purpose for that individual, to further excel through programs such as Design your Life, Goal Setting, Strategic Planning and Performance Management. These session would equip the individual to have clarity, in what he / she would like to do, the direction in life they take. It would also align the person’s personal Vision, Mission & Core Values (VMC) with that of the Organization, with focus on the effectiveness of their daily throughput.Many Organizations have reaped huge benefit from this alignment. We cap phase one with Emotional Intelligence. This is similar to putting the icing & strawberries on the plain Chocolate cake to deliver the Black forest cake. From our experience we have found, most participants are very well equipped technically but seem to have a dip in their non-technical / behavioral skills, in particular their levels of Emotional Intelligence. This is a heart-felt program, and have found segments of this session pierce though to some to the extent of break downs happening during the session. With the experience of the trainers, we nature the participants back to cope with their encounters. It is an experience that one should walk through to appreciate what is involved. We have had constant feedback from participants who have expressed how this was their turning moment (AHA Moment) in creating that required shift. You are welcome to contact us for information or an obligation free discussion or Curtain Raiser, on the above three sessions, of Phase One. We culminate this growth through Leadership development programs.